There are many credit card processing companies in the United States, but few are as large and as successful as Elavon. The company was founded nearly 23 years ago. As the fourth-largest credit card processor in the country, Elavon is Better Business Bureau approved and currently boasts the highest score possible, an A+. When granting this coveted rating, the BBB pointed out a handful of impressive factors the company displayed, including the low volume of complaints against the company, the length of time Elavon has been in business, its quick response time to all 251 consumer complaints, its complaint resolution process, and abundant background information. Besides the incredible rating from the BBB, what makes Elavon merchant services so great? In short, what makes Elavon’s merchant services so great is its unique focus on catering to businesses. The payment processing services and solutions available to businesses are abundant, and they include everything from mobile solutions to in-store and online options. Additionally, Elavon doesn’t discriminate against the type of business it serves. Any type of business is welcome to use the company’s services either via Fusebox, Elavon’s secure, reliable, and flexible payment gateway, or a third party, so long as that third party is compatible with Elavon. Businesses of all kinds also enjoy Elavon because its payment processing solutions and services accommodate the main credit cards, such as MasterCard, Discover, Visa, and American Express. Additionally, Elavon allows business to use debit cards, UnionPay cards, gift/prepaid cards, and e-checks. However, that’s not all. Elavon also works hard to accommodate online business by offering an API and online payment processing option. Truly, the company has the ability to accommodate any business, no matter what payment method(s) a business chooses. No one likes paying fees, especially to access or spend money. That’s why Elavon offers reasonable flat-rate fees and plans, including mobile and terminal offers void of annoying “hidden” and cancellation fees. However, it’s important to note that termination fees can also be incurred by using the company’s interchange-plus pricing model. This particular scenario would result in early termination and monthly minimum fees. In an effort to cater to all types of customers, Elavon works hard to offer a number of payment gateways to choose from, including Fusebox or a third party of a business’s choosing. Wondering what Fusebox is exactly? Well, it’s a convenient gateway that offers stability, connectivity, security, flexibility, visibility, and simplicity to businesses. It’s a popular payment gateway because it accepts American Express, Visa, Discover, MasterCard, gift/prepaid cards, and even e-checks. Additionally, businesses rave about it because the overall system is efficient and so secure that it keeps business and customer information protected behind strong firewalls. Fusebox is also designed with PCI and PA-DSS security standards to defend against any potential data risks. Who doesn’t enjoy being able to do virtually everything from their mobile device? Elavon understands this, which is why it offers a free app for businesses to process transactions on the majority of Apple, Android, and even BlackBerry devices. As an added bonus, it even offers a card reader option to process transactions if businesses prefer that method. At the end of a transaction via mobile app or card reader, payment data are kept in a secure location, while receipts are emailed or texted to customers. Talk about convenience. In addition to Elavon’s convenient mobile capabilities, it also accommodates e-commerce merchants by offering online processing options like Magento, WooCommerce, and Shopify. All of the processing options integrate seamlessly with Elavon’s MyVirtual Merchant. However, it’s important to note that, for small and medium businesses, it more beneficial to use Elavon’s own API and payment solution. Why? Well, it’s outfitted with the latest and greatest fraud detection and security tool to protect business and customer data. Since Elavon takes care of the payment processing side of things, all the business and customer data are stored with Elavon for added security. We’ve talked a lot about Elavon’s mobile capabilities, but we can’t forget about the equipment that is used to actually process payments, such as the devices used to swipe customer cards. With Elavon, all of the equipment is sold with any necessary hardware to function, as well as software and apps to help the hardware function at its best. Over the years, one big area where Elavon has improved is that it now sells, rather than leases, its equipment. The company used to lease everything, but due to customer complaints related to annoying lease agreements and fees, Elavon decided to change things up a bit and now just sells everything. So far, customers have welcomed this move, enjoying not having to worry about things like contracts, termination fees, monthly payments, and other hidden fees. Ingenico iCT250: The iCT250 has a “magic box” cable management system that prevents cable tangle and clutter. The terminal boasts a color display for improved readability and ease of use. Verifone VX520: The VX520 has a built-in secure software authentication process, which prevents unauthorized software applications from being downloaded. Ingenico iCT220: This can be combined with an iPP320 for a consumer-facing solution to support contact-less payments. The iCT220 has a “magic box” cable management system that prevents cable tangle and clutter, along with a black-and-white screen for crisp visual clarity. In addition to the hardware and equipment options, Elavon also offers software, such as Converge, which is designed for desktop use. It allows users to manage every single one of their transactions, including transactions completed via mail or telephone, in-store, e-commerce, or mobile. Converge is also convenient because it allows users to access it from anywhere, on any computer. No special downloads, equipment, or upgrades are required for it to work. Additionally, the software caters to mobile transactions by offering a free app and is equipped with high-security measures to protect all sensitive data collected during transactions. Whenever sensitive information is involved, it’s important to have good security and privacy protocols in place. Fortunately, Elavon takes these matters seriously and offers a number of security checkpoints throughout different stages of a payment process. For added peace of mind, customers who don’t want Elavon solely in charge of processing a payment can always involve a third party to secure certain parts of a transaction. Additionally, customers are always in charge of what kind of connectivity to use when using Elavon’s merchant services, such as VPN, MPLS, SSL, and dialup. Customer service is an important feature of any business, especially when you have customers all over the world that might need assistance any time of the day. Fortunately, Elavon offers customer service assistance via phone or email 24/7 to customers in the United States and even offers assistance in many other countries in nine different languages. Additionally, the Elavon welcome center page offers many resources for new and existing customers, as well as contact details for reference personnel. Training assistance is also available Monday through Friday, 8:30 a.m.-9 p.m. EST. However, it’s important to note that if customers use third parties at any stage, they will likely need to contact the third party’s customer support for assistance in addition to Elavon. 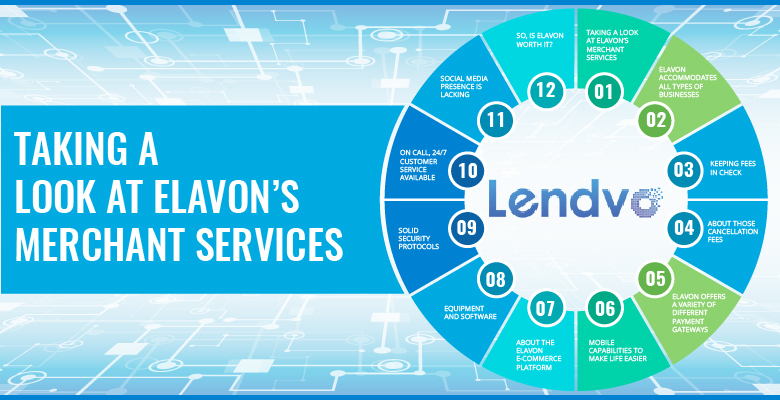 While Elavon has invested and spent time polishing many aspects of its merchant services and solutions available to customers, it seems to have skipped the social media side of things. While many businesses have Facebook, Twitter, or LinkedIn pages to connect with other businesses and customers, Elavon has yet to develop its pages. Because of this, any questions, comments, or concerns have to go through Elavon’s Contact Us page. So, Is Elavon Worth It? There are many advantages to Elavon’s merchant services that make it a worthwhile investment for businesses. The fact that the company is so accommodating of an array of payment processing options means that virtually every type of business can use Elavon’s services. Additionally, because Elavon can complete an entire payment process without the aid of a third party, businesses can have the peace of mind of knowing their sensitive data and customer information are protected and secure. The company’s flat-rate pricing, lack of hidden fees, and 24/7 customer service are other attractive features. As for the disadvantages? Well, at times, the prices of its equipment can be expensive, and those who want to cancel services through Elavon may have to pay expensive early termination fees. Every company is different and has different wants and needs. It’s up to the individual company to decide what will work best. However, given the fact that Elavon’s services and solutions are so flexible and accommodating, it could be a great option for any business.